Film trilogies used to be a thing. Convention once suggested that three was the perfect number of movies needed to tell an extended story. Two was never enough; stopping there clearly meant you hadn’t found the audience support you’d hoped for, whereas four or more was an indication that you’d got more bums on seats than you’d expected and had started to rate money over artistic integrity. In these cases a serious downturn in the quality of your output was inevitable. (You’ve all seen Star Trek: The Final Frontier right?) Yep, with the exception of James Bond who had a whole series of books to get ideas from, a neat trio of features was what respected film makers would settle for. A fourth chapter of Star Wars, The Godfather or Back to the Future would have been unthinkable. It is significant that when George Lucas did actually decide to extend his Star Wars saga it was in the form of a whole separate trilogy; The Phantom Menace was demonstrably not Episode IV. It’s not clear exactly when things started to change, Alien and Lethal Weapon went for a part four as far back as the late 90s but it was probably around twenty years after this that longer film series became a proper trend. Die Hard 4 was released in 2007 and then Indiana Jones and the Kingdom of the Crystal Skull came out in 2008 but it was Harry Potter that properly paved the way. Like Bond, the adventures of the boy who lived were based on a run of excellent novels and they’d already got to number six without losing viewers or many cast members. Then came the decision to split the last book into two parts and in turn every youth focused fantasy series responded in kind. Suddenly tales that were already divided nicely into three parts on the page were becoming tetralogies. Twilight went this way and The Hunger Games and Divergent series have followed suit. Oddly now even Marvel Studios, who seemed to be sticking to the old trilogy format, have announced that the final Avengers story will be filmed as Infinity Wars part 1 and Infinity Wars part 2. So it is then that fourteen years after number three we now have Jurassic World; a fourth Jurassic Park film, and a fifth Terminator movie that undoes the previous instalment’s efforts to start off a new trilogy by tying everything back to the original setting. X-Men 5 did a similar thing last year. There’s also the drawn out Hobbit trilogy which kind of turned the Lord of the Rings into a hexalogy. Toy Story 4 is due in 2017 and heaven knows how many Transformers films there are now. Even The Transporter and Alvin & the Chipmunks are getting a belated numéro quatre so it seems that nothing is sacred. It’s only Christopher Nolan keeping it old school again. Seriously, if Kieslowski were alive today I’m sure he’d be prepping to make Three Colours: Yellow. We can mourn the loss of original thought in Hollywood if we want to but the fact is that a lot of these new franchise films are actually good and they are raking it in at the box office. By all accounts the Fast & Furious films got better after the initial three and seven has just done incredible business becoming the fifth highest grossing movie ever. Jurassic World is third. 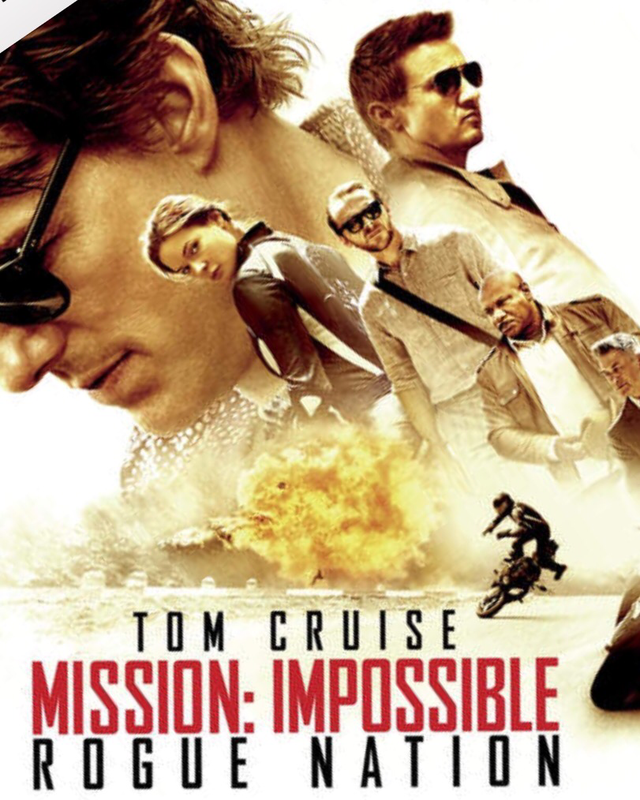 There was a time then that a fifth Mission Impossible would have raised eyebrows, garnering comments about how desperate Tom Cruise must be to return to this old franchise and attracting only a limited number of viewers before slowly making its money back on DVD. Those days are well and truly gone though. Rather than being a tired retread trying to get by on the reputation of previous films, Mission Impossible: Rogue Nation is an ambitious $150 million espionage thriller that equals if not eclipses other movies of its type including some of those within its own series. Following on from last year’s Edge of Tomorrow it also shows that Tom Cruise, far from clinging to past glories, is still an action star at the top of his game. Frankly if the Mission Impossible people are going to keep producing films of this quality then they can make as many as they like. One of the reasons that the Mission Impossible movies continue to work is that the formula is fairly flexible. You’ve got a small team of spies using high tech gadgets to infiltrate and out manoeuvre formidable and sophisticated enemies. There are any number of stories you could fit round this and over the years we’ve seen different instalments involving corporate terrorism, double crosses, rogue agents, personal vendettas, government interference and lots of international locations. Rogue Nation incorporates all of these but still manages to be the most straightforward of the series. Super spy Ethan Hunt is not compromised by love this time and he is not facing off against old friends, he is just on a mission to bring down the bad guys and he’s doing it through a series of highly impressive set pieces. There is an argument that the action sequences in this film could happen in pretty much any order but the story is more than sufficient to tie them together. Basically there is a covert organisation (not unlike SPECTRE) causing death and disaster across the world. As the strength of this group grows, Hunt’s independently run agency, the Impossible Missions Force (not unlike SHIELD) is being disbanded and subsumed into the CIA, once again leaving only a small handful of agents to work the case. (The Impossible Missions Force is a terribly cheesy name for the group and is clearly a hang over from the original 60s TV show. Understandably they only ever referred to as the IMF in this film.) This narrative does give us some talky moments but they all move things along intriguingly and it’s never long until there’s more running, shooting, jumping, driving and hanging off things. Hanging from high places is a bit of a recurring motif for this film franchise and having done the Burj Khalifa building in Dubai last time they could only better this by having Cruise cling to the side of an aeroplane in flight. This stunt has featured heavily in the publicity for the movie and I was concerned they’d played their best card too early but actually it happens right at the start and there are better orchestrated if less audacious scenes still to come. The stand out for me was the extended car/bike chase in Morocco but there are plenty of others to choose from. In fact, despite following this new trend for extended film series, the movie is quite old fashioned in its approach to the stunt work. The CGI is kept refreshingly to a minimum with most of what you see happening in camera and which film fan isn’t going to love that? The movie also feels a little retro in the way it is built around its star. There aren’t many actors who are guaranteed to bring in the crowds anymore and back in 2006 Tom Cruise and his off screen reputation were actually blamed for the poor performance of Mission Impossible 3. This one though has opened well both commercially and critically. The casual cinema going public have clearly forgotten about Cruise jumping on Oprah’s couch and his whole Scientology thing and I understand why. Some people can’t get past his personal life but for me it is the other way around; I can’t get past his film persona. Cruise is a great screen presence and Rogue Nation fully capitalises on him and his particular set of skills. Way more than something like Bourne, this series couldn’t go on without its hero. (Although Jeremy Renner is really good here.) There is no one else in Hollywood that can give you charm, athleticism and close ups during the stunts in quite the same way as this 5ft 7 fifty three year old. Like all the Mission Impossibles though, this in no one man show. Over the years the films have featured Jon Voight, Emmanuelle Béart, Jean Reno, Kristen Scott Thomas, Thandie Newton, Dougray Scott, Brendan Gleeson, Michelle Monaghan, Philip Seymour Hoffman, Laurence Fishburn, Eddie Marsan, Jonathan Rhys Meyers, Léa Seydoux, Anil Kapoor, Anthony Hopkins, Vanessa Redgrave, Simon Pegg, Ving Rhames and Jeremy Renner. These last three are back again being joined by Alec Baldwin, Tom Hollander and an actress you probably won’t of heard of but who is bound to make it big on the back of this named Rebecca Ferguson (more on her later). As ever the supporting players support well each adding much to the ensemble. In the end Mission Impossible: Rogue Nation gave me exactly what I wanted, a very enjoyable two hours in the cinema. There is one thing though. The final showdown is staged in London. I have no problem with that, Ethan Hunt has been here before, but did they really need to add the smog? It seems that for some moving past old national stereotypes is just impossible. Cinema has already given us one great female action hero this year in the shape of Mad Max’s Imperator Furiousa and now we have another. Rebecca Ferguson’s Ilsa Faust is an excellent role model. She is courageous, she has superb fighting skills, she holds her own against all assailants, she is smart and she saves the day more than once. Here we have a female character who is not only the equal of the male lead but, unlike Scarlett Johansson’s Black Widow in the Marvel movies, could easily carry a film of her own. This probably won’t happen but I hope she will be back for Mission Impossible 6. They do manage to get in a fairly pointless shot of her in a bikini but they also strip Tom down to his waist earlier in the film so I can let that one go. The film has fairly typical levels of action and violence for a 12A and is one of those movies that would have scraped a PG before the certification was introduced thirteen years ago. Unlike a lot of similarly rated films though it doesn’t seem to have been made with a preteen audience in mind. As such younger kids may not follow the intricacies/contrivances of the plot.